Transport across the sands of time to Ancient Egypt. The Mummy online slot is based on the Universal Studios movie The Mummy released in 1999. Powered by Playtech, the 5-reel, 25-payline video slot comes well-equipped with tons of features and bonuses. This game remains one of Playtech’s most popular online slots to date. Read on and it’s easy to see why! The Mummy online slot is based on the 1999 movie, The Mummy, starring Brendan Fraser and Rachel Weisz about a group on an archaeological dig in Egypt who accidentally awaken a mummy. Personally, I am a huge fan of this movie and frankly anything associated with Ancient Egypt. There’s something to be said about the living dead and ancient curses. If you haven’t seen the movie you’re missing out… and if you haven’t played this online casino it’s about time you joined the fun. This video slot will surely satisfy the appetite of an adventurous spirit looking for Pharoah’s ancient treasure. A golden sarcophagus, the book of the dead, Colt single actions, scarabs, and an Ancient Egyptian priest turned mummy returning from the dead… just a few of the graphics featured on The Mummy’s video slot. Hit the right combination and enjoy your favorite clips from the movie featured throughout the game as well. 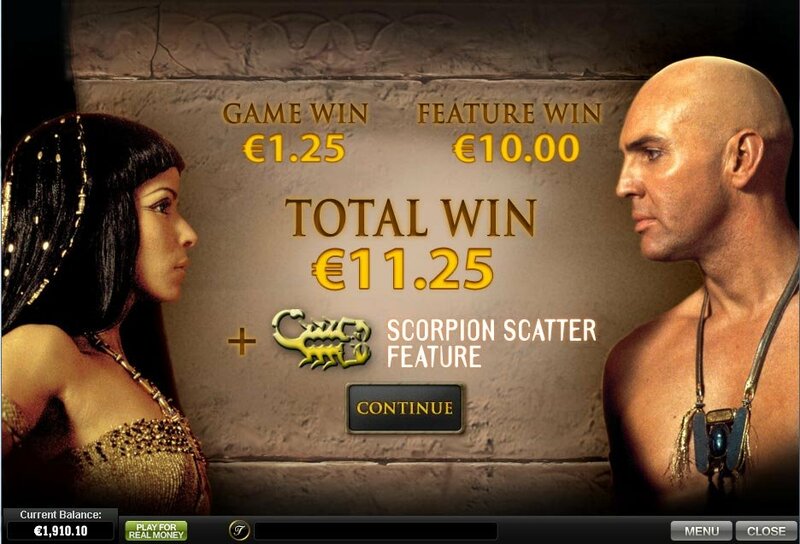 The Mummy online slot really packs a punch in terms of features. 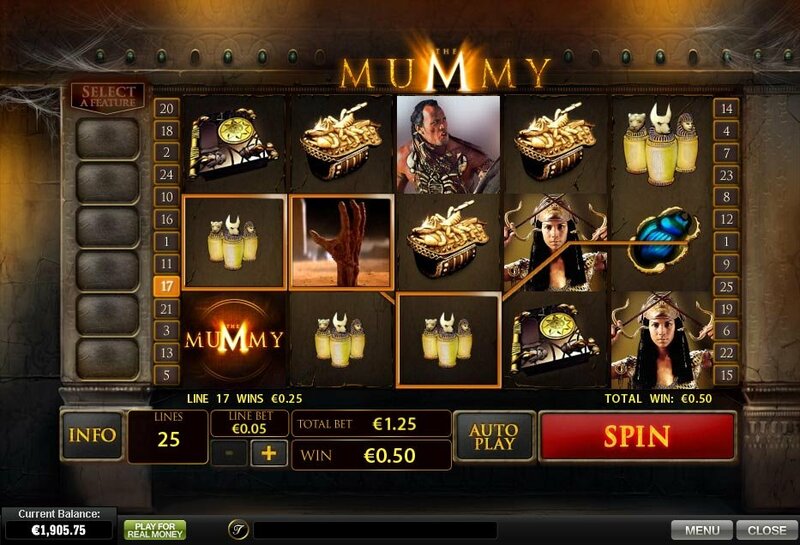 The game features tons of winning combinations along with free games, wild symbols, and bonus games such as Mummy Hunt Bonus, Lost City Adventure Bonus, and several more. Ok, first of all there’s the Lost City Adventure Bonus randomly triggered during the main game. 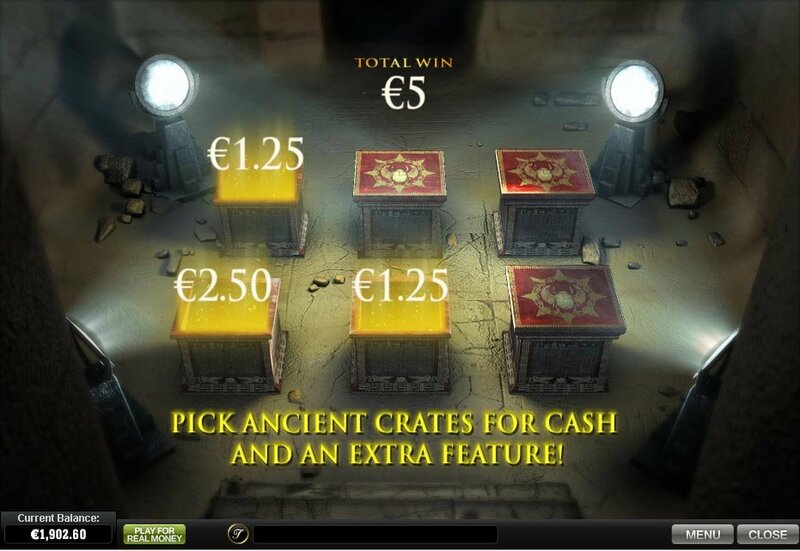 During this bonus game, you will transport to the Lost City of Hamunaptra, and pick boxes in the mummy’s vault for cash and to unlock more game features. Choose “Collect” ends the bonus game. Now, when entering the bonus game wins cash prizes as well as 1 out of 8 features to be used in the main game. A new feature will be won every time until all 8 features have been won. Then 6 of the 8 features will appear at the side of the rides. You may only activate 1 of the 6 features and all have their own special function, making the game even more interesting. Thought I was done? There’s even another mini-game called the Mummy Hunt Bonus where you can kill a Mummy for cash. The Mummy Hunt symbol appearing anywhere on reels 1 and 5 triggers this bonus game. You will come to a crossroads where you must choose whether to go right or left. Your choice will lead you to a mummy or a dead end. If you meet a mummy, kill it for cash and continue down a tunnel to find another crossroad. If you choose a dead end, the mummies will ambush you and the bonus will end. A maximum of 10 mummies can be hunted. Overall, the game has enough features to keep things interesting while also bringing in plenty of bonuses so that it’s not too difficult either. Although it might take some time to fully understand the different aspects of this video slot. - So many features and bonuses!